Lausanne, Switzerland - In a series of studies, social psychologists show that educational tracking – grouping students based on their achievement levels - encourages evaluators to artificially create social class inequalities. Three studies reveal that evaluators consider a lower track more suitable for a low socioeconomic status (SES) pupil and a higher track more suitable for a high-SES pupil, even when school achievement was identical. 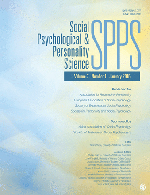 The results appear in the journal Personality and Social Psychology Bulletin, published by the Society for Personality and Social Psychology. “Our research suggests that the selection required by the tracking system may lead evaluators to artificially create academic differences among students, as a function of their socio-economic status,” says Anatolia Batruch one of four researchers from Université de Lausanne, Switzerland associated with the studies. Frédérique Autin, Fabienne Bataillard and Fabrizio Butera are the other collaborators on the project. The researchers designed their experiments to resemble actual tracking dilemmas that can occur in Swiss schools when teachers and the principal can offer a second chance to pupils who are borderline cases for a higher track. These tracking systems, grouping students by abilities and academic achievements, are similar throughout many countries. In the first two studies, college students playing the role of teachers, (N =99), and teachers, (N = 70) decided which school track was suitable for a pupil whose socioeconomic status (SES) was manipulated. Although the students’ achievement was identical, participants considered a lower track more suitable for lower SES than higher SES pupils, and the higher track more suitable for higher SES than lower SES pupils. A third study (N = 160, first year college students), explored the language used to describe the function of school and its goals. The results showed that a focus on selection, or “to orient students according to academic abilities and lead everyone to the maximum of their potential”, led tracking to be associated to SES inequalities--even when achievement was identical—more than when participants were presented with a description focused on education. “Allowing students who almost meet the criteria to follow an academic path could be interpreted as offering these students a privilege, which is, in the case of our studies, more readily offered to high-SES students than to low-SES students,” says Fabrizio Butera.